Third grade students in my computer lab class read the introductory messages from Mrs. Campbell's and Mrs. Mason's first classes who are participating in Kidlink's "Who Am I?" program. In these introductory messages, students in the two classes wrote about what they want to be when they grow up. 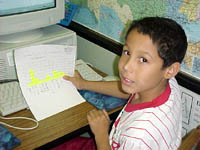 More student messages in this program from other Delmar classes and from all over the world are on the Kidlink "Who Am I?" student pages. Student participation in all 6 of the "Who Am I?" modules is also on the WWW. The students then had data they could organize into meaning information. My computer lab students read the messages and used a marker to highlight the career in each student's message on a printed copy of the messages I gave them. I provided my students with a tally sheet to record the named careers and the number of times each career was chosen. These second graders made the graphs you see below from the tally marks they made. 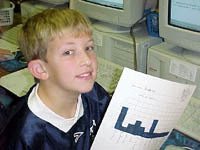 The students took the data and organized it into meaningful information. 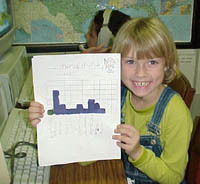 They made visual representations of the information - tally sheets and graphs. 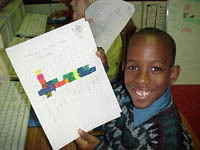 The students then analyzed the data they found in the messages and were asked to write a sentence about what they discovered. 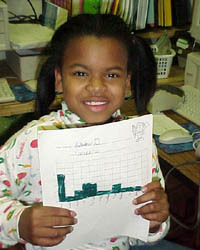 They have come to new insights after reading, organizing, displaying and analyzing the data. Below are messages the students sent as e-mail to Mrs. Campbell, Mrs. Mason and their students. Writing is an important part of all we do. 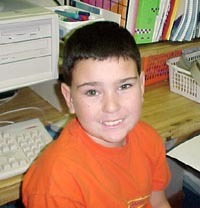 I looked at your webpage and this is what I found out. I know there are 19 students in Mrs. Mason's first grade because I counted tally marks. Then I made a graph. The graph shows that being a policeman is a popular career in your class because 5 students picked the policeman. There are 21 in your class because I Iooked at the graph. The graph shows the teacher is most popular career and singer is next most popular in your class. I know you have 19 students because I counted the tally marks. The graph shows 5 students want to be a policemen. It is the most popular career in your class. There are 21 students your class because I counted 21 students from my graph. There are 3 careers that 2 students have chosen. They are doctor, firefighter and singer. There are nineteen students in your class, because I counted your class graph. In your class 2 students each said they want to be a doctor, teacher, soccer player, Olympic skater and gymnast. I know that 21 students are in your class because I counted 21 students in my graph. The two most favorite careers in your class teacher and vet.